Although the ingredients are similar to how I would normally prepare them, adding in a bit of ginger greatly enhances the natural sweetness of the sweet potato. Thinly slicing and layering the potatoes, then baking in the oven, makes them really tender and produces a nice caramelized crust on top. 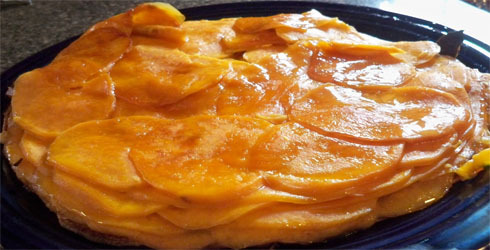 Summary: A delicious and different way to prepare sweet potatoes. A perfect side dish to any meal, and babies love it too. Move oven rack to lowest position and preheat oven to 400°. Combine oil and butter in a small bowl. Line a 9-inch pie plate with aluminum foil, and brush lightly with oil-butter mixture, reserving the rest. Toss potatoes with a scant tablespoon oil-butter mixture and remaining ingredients in a large bowl. Make sure that all potato slices get a nice coating. Arrange potato slices in bottom of pie plate in slightly overlapping concentric circles. Add another row of potatoes, lightly brush potato slices with oil-butter mixture. Layer remaining slices on top, and drizzle with remaining oil-butter mixture. *Dish can be made ahead up to this point, covered with plastic wrap, and refrigerated up to 2 days. Before baking, cover potatoes with foil, weigh top with flat, heavy lid or pan (I use my cast iron skillet), and bake 30 minutes on bottom rack. Remove pan and foil and bake another 30 to 35 minutes or until potatoes are brown. Remove from oven and invert onto a serving platter. Save time by using a food processor to thinly slice the sweet potatoes. If you don’t have a food processor, you can slice by hand using a sharp knife, but this will add time to your preparation. I took a serving of these sweet potatoes and pureed them for my 7 month old. He loved them! There is not too much brown sugar or ginger, so it is a perfect way to introduce different spices and flavors to babies.